Joe W. Vice was born in Nunez, Louisiana and raised on Chaneau Road by his grandparents. He attended Abbeville High School and then moved to Lake Charles and attended LaGrange High School. He joined the U.S. Army when he was 17 years old and served combat tours in Korea and Vietnam. In 1953, he took parachute training and became a paratrooper and served with the 101st Airborne Division Troop B 17th Calvary. He had the honor of being the platoon sergeant of the Division Honor Guard and Drill Team. In 1961, he went through Special Forces (Green Beret) training and was assigned to the 10th Special Forces Group in Bad Tolz, Germany and later was assigned to the 5th Special Forces Group with Project Delta (Det. B52) which is now called the elite Delta Force. While in the military he used his Cajun French in different countries that he was assigned, especially in Vietnam. His Cajun French was used in interpreting orders from U.S. commanders to Vietnamese personnel. After retiring from the military, he moved back to Louisiana and made his home in the Meaux community. Vice worked offshore on a drilling rig for two years. Later, he joined the Vermilion Parish Sheriff Department and worked under Sheriffs Euda Delcambre and Ray Lemaire for 26 years. 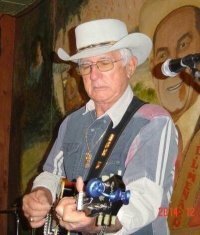 He started playing Cajun music in 1984 with his mentor Minos Hardy who at the time was with the “Fas Tras Cajun Band.” Vice has played with different Cajun bands, but now only plays at jam sessions, nursing homes or private parties. His love of Cajun and Classic Country music has allowed him to assist the Acadian Museum with its Living Legend program which takes place monthly during his jam sessions at the Museum Café.